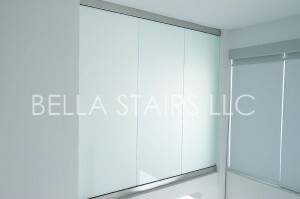 Bella Stairs would like to introduce our newest product: Privacy Glass! 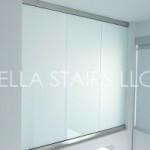 We at Bella Stairs likes to branch out and explore the many capabilities of glass. 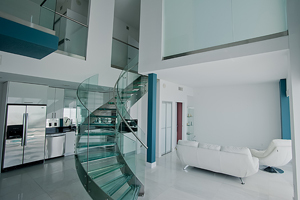 Privacy Glass has the capability of switching from Frosted Glass to Clear with a simple electrical connection. By wiring the connection to any light switch, this high-end product can customize any living space. 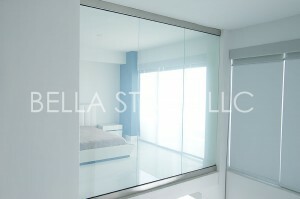 This Privacy Glass wall encloses the master bedroom, making this Downtown Miami loft apartment stand out from the rest. I live out of country. Is it possible to purchase cut pieces to fit window panes and install “myself”? I will be in Florida shortly. Thank you for the information. Regarding your question, we would not recommend installing this product without an experienced, and licensed contractor. This is due to the product’s need for various trades (electrical, glazing, etc) and makes the installation more complex.